Inexpensive display hacks are key for those who are looking to have an eye catching display, without breaking the bank. Speaking from personal experience, getting your booth together for a craft show can be tricky. Not to mention expensive! However, we are here to share these hacks to save your bank account. The thrift store, yard sales, and the dollar store will be your best friend. You can find all sorts of inexpensive display props for every season or theme. You will find everything from cheap (yet high quality) tables, stands, baskets, and trays. Even if you find something that is slightly what you need, you can always upcycle the item. 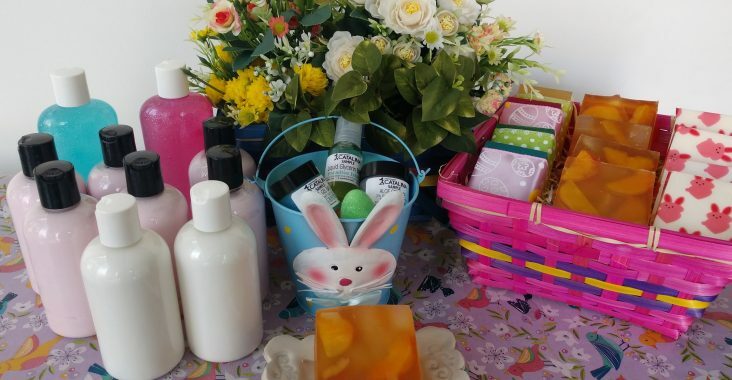 $1 basket, with $1 ribbon wrapped soap. Colorful bamboo baskets are great for spring and Easter, However they can be spray painted white or brown to be used for the rest of the year. Most dollar stores have plastic buckets, often used for holding drinks. If you aren’t fond of the bright colors, coat them in silver spray paint for a faux metal look. Shelves and tables are absolutely necessary for craft shows. You want depth to your booth, and adding shelves on your table really helps showcase product. Thrift stores are the holy grail of finding old shelves and tables. There you can find inexpensive plates and candle sticks to create display stands. Check out this step by step by this blogger (source 1). Bows and boxes are readily available at the dollar store. Ribbon is very useful to have on hand, especially around gift giving holidays. It can be tied to the tops of gift bags or it can be wrapped around soap. 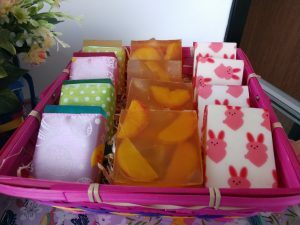 Layering ribbon and paper around soap adds a crafty touch. Flowers are a great prop to have on your table. And to make sure they last all craft show season, using faux flowers is a good idea. The dollar store has a great selection of faux flowers. Accessorizing the table with pieces that match the season draw in all kinds of eyes. For example, fall time brings out the festive side of people. Add pumpkins (real or fake), fall leaves, woodland creature figures, and autumn towels to your display. All of those can be found inexpensively at the dollar store, or big brand stores in the discount or clearance section.